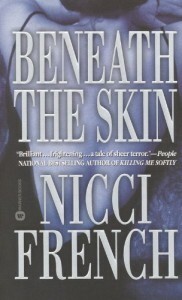 Beneath the Skin is the first book I've read by author Nicci French. The story is told in parts by the three women targeted by a sadistic killer. Once he has his target selected, he sends the woman letters stating that he is going to kill her. He watches her unravel (showing what's beneath the skin) and then attacks. Part of his thrill is that he can torment his victim right under her nose, and without detection/suspicion of the police. We actually find out who the person is in the second part of the book. I'm still torn on if I like that or not. I think I would have enjoyed it more if I were still guessing into the third woman's story. The person turned out to be one of my top two picks, but there was still a twist that I had only partially guessed. Even though we knew who it was halfway through the book, I was still able to remain engaged in the story all the way to the end. There were a few parts that I felt were drawn out or unnecessary (like when Jenny is planning a dinner party and we are told in excruciating detail how she put together all the food). I had two main issues with the book. The first was that I didn't really care about any of the women. I wasn't able to connect with any of them and therefore didn't really care if the killer carried out his threats or not. They all had flaws and were essentially doormats for their boyfriends/husbands, but that wasn't even the reason I couldn't connect to them. They just felt very flat. My other issue is with how the murders are solved at the end of the novel. I've experienced moments when a lightbulb suddenly lit up in my mind and clarity followed. So I can see how it might happen suddenly, but the way it was executed and how the person reacted when realizing the truth felt somewhat rushed and unbelievable. While Beneath the Skin wasn't one of my favorite books, I really enjoyed it and liked it enough to want to read more books by this author.